Casey Elsass and Morgen Newman blend maple syrup from the Catskills and coffee from a favorite brew brand. What if you could enjoy that delicious, brunchtime buzz any day of the week? We're not talking about bottomless mimosas, but about the warm, comfort-food sweetness of natural maple syrup, and the bright-eyed magic of your favorite cup of coffee. That combination in Casey Elsass and Morgen Newman's blend will not only perk up your French toast and flapjacks, but can also transform ice cream or your favorite cocktail into a uniquely indulgent pick-me-up. Handmade in Brooklyn. We like to add this to milk or pancakes, on top of ice cream or mixed into cocktails. I always have a hard time shopping for my Dad. I love the unusual gifts and I love food! My dad seemed to like it and called me right away. He was wondering if it was syrup for his coffee, so I did have to explain it was coffee flavored syrup for his pancakes. Maybe the packaging wasn't clear. But I bet it would be good in coffee too! So good it will knock your socks off! 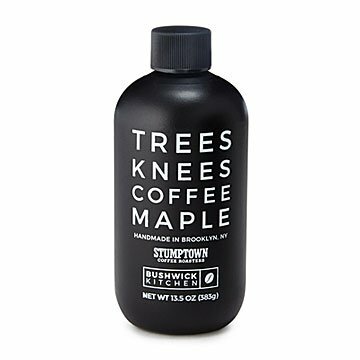 The perfect way to start a great morning: coffee and maple flavors in one delicious syrup! I have tried it on waffles, pancakes and ice cream. It was wonderful on all of those but it was over the top good on oatmeal. Just one tablespoon and you have a wonderfully complex, delicious breakfast.